There’s rugged. And then there’s Abaco rugged. At Abaco, we design rugged in. That means choosing screened parts. State of the art mechanical engineering. Using conductive materials. Soldered components. Advanced cooling. Created to operate in the harshest of environments, our products now reflect our unparalleled experience and expertise in creating truly rugged solutions, with our unique combination of design evaluation and assembly and test practices through to advanced thermal management, mechanical engineering and hermetic control techniques. We make our products rugged by upgrading or screening parts for extended temperatures, adding mechanical stiffening bars, and/or changing substrate materials for thermal conduction. An integrated stiffening frame/thermal management assembly is used to optimize the mechanical dynamic and thermal performance. A variety of conformal coatings are available for humidity and static control. Develop on rugged level one. Deploy on any of levels two, three, four or five. Simple, straightforward – and cost-effective. You can choose from five levels of ruggedization for maximum cost-effectiveness, with 100% application portability from benign to conduction-cooled. Knowing that our products will be deployed in a wide range of harsh military, aerospace and industrial environments, we offer five distinct ruggedization levels. Development systems are compatible and interoperable with deployed systems through the use of shared circuit design and software compatibility, allowing the most cost-effective option to be selected. 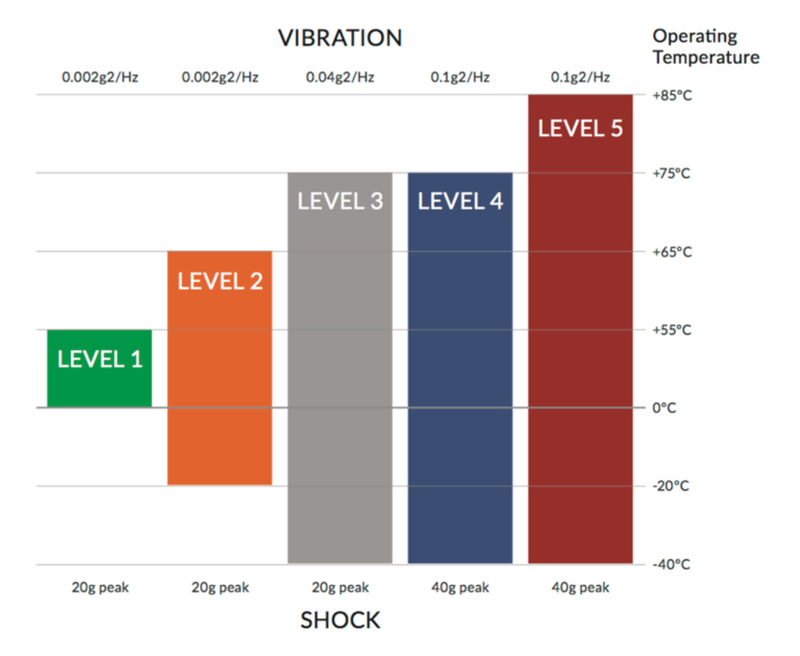 Each of the five levels differs only in the mechanical build standard, type of cooling and the quality of the electronic components used. Our five rugged levels offer increasing levels of environmental durability, enabling operational goals to be met at the lowest possible cost. Each rugged level has been carefully tailored to provide the optimal trade-off between cost, performance and reliability. Selection will depend on the type of cooling required–either forced air or by conduction – and the overall requirements for environmental performance. Fully compliant with the ANSI/VITA 1-1994 VMEbus and IEEE Std 1101.2-1992 conduction-cooled specifications, our products can be used with complete confidence in conjunction with both in-house designs and other vendor products that meet the same internationally recognized standards. Our patented cooling technologies deliver not only the utmost dependability, but also the highest performance at high temperatures. Our experience, expertise and patented technologies in cooling don’t just deliver maximum reliability – they allow components to operate at maximum capacity, providing superior performance. Take our SBC347D 3U VPX single board computer, for example. Abaco’s advanced cooling means it can maintain its maximum rated processor speed – even at temperatures as high as 75C. Advances in processor technologies not only result in increasing power consumption, but also, as device geometries decrease, losses due to leakage currents increase while the surface area of the die from which heat must be extracted decreases. This leads to a need to continually innovate in techniques for extracting heat from devices, boards and systems. Abaco Systems is uniquely placed to advance the state of the art in thermal management techniques. Advances come from both internal and external research, such as DARPA contracts. By working on leading edge technologies such as Thermal Ground Planes and Near Junction Cooling of devices as research programs, then transitioning them to deployable implementations, higher power devices can be deployed and junction temperatures can be reduced, leading to better reliability and mean time before failure. Our engineers take a holistic approach to thermal engineering of a system. We address issues at every stage of heat extraction from the device level, through the board assembly and heatsinking, the thermal interface to the chassis and from the chassis to the final dissipation to the environment. Only by using such an approach can the deployed system be truly regarded as being optimal. When we’ve built it, we test it. Rigorously. Again and again. And then some more. Our comprehensive ISO9001/AS9100-certified development process lowers development costs, reduces non-recurring engineering costs, and substantially cuts system program risks. In addition, project time-to-market is improved because both the Technology Readiness Level (TRL) and Manufacturing Readiness Level (MRL) will be much higher with our subsystem technologies than through the development of analogous proprietary systems. Our Qualification Test Plan and Qualification Test Report documentation services provide further risk protection for system developers. Typically, the qualification cycle would start with functional testing, followed by thermal cycling, shock, random vibration, thermal vacuum, and electromagnetic radiation tests. An open box inspection would be conducted after completion of testing. Abaco rugged. It’s why we’re trusted where it matters most. One of the aspects of defense programs that is different is their longevity. That has significant implications for the technology that’s at their heart. Here, we look at the options available to maximize a platform’s viability well into the future. The rugged small form factor AERIAL1 Mission Computer combines state of the art Power Architecture™ CPU technology with extensive I/O capability to deliver unprecedented levels of performance for rugged avionics mission computing applications. The drive toward Modular Open Systems Architectures (MOSA) is at the heart of Abaco’s selection of technologies, and this paper examines how this can positively impact programs.